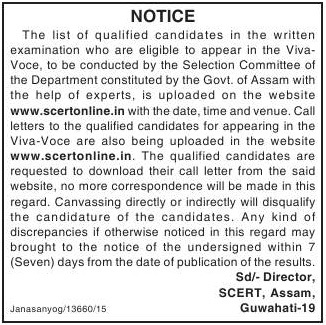 qualified candidates for appearing in the Viva-Voce are also being uploaded in the website www.scertonline.in . The qualified candidates are requested to download their call letter from the said website no more correspondence will be made in this regard. Canvassing directly or indirectly will be disqualify the candidature of the candidates. Any kind of discrepancies if otherwise noticed in this regard may brought to the notice of the undersigned within 7 (seven) days from the date of publication of the results. You can download the official notification form below.